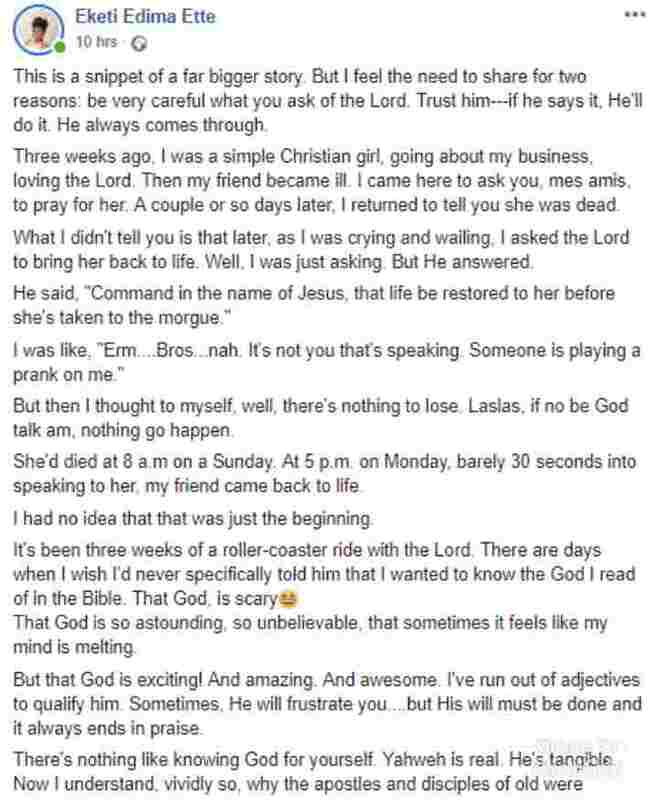 A Nigerian writer has narrated how her friend resurrected after she prayed for God to bring her back to life. Eketi Edima Ette said her friend died at 8 a.m. on Sunday and the spirit of God told her to pray for the friend before she was taken to the morgue. She was doubtful but she obeyed and her friend came back to life on Monday at 5 p.m. This is a snippet of a far bigger story. But I feel the need to share for two reasons: be very careful what you ask of the Lord. Trust him---if he says it, He'll do it. He always comes through.Three weeks ago, I was a simple Christian girl, going about my business, loving the Lord. Then my friend became ill. I came here to ask you, mes amis, to pray for her. A couple or so days later, I returned to tell you she was dead. What I didn't tell you is that later, as I was crying and wailing, I asked the Lord to bring her back to life. Well, I was just asking. But He answered.He said, "Command in the name of Jesus, that life be restored to her before she's taken to the morgue. "I was like, "Erm....Bros...nah. It's not you that's speaking. Someone is playing a prank on me." But then I thought to myself, well, there's nothing to lose. 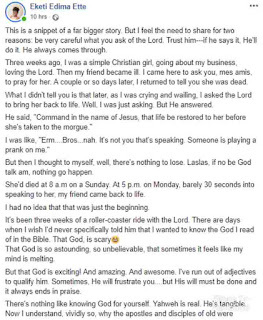 Laslas, if no be God talk am, nothing go happen.She'd died at 8 a.m on a Sunday. 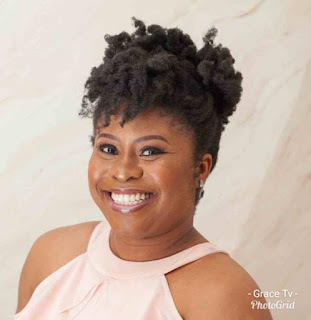 At 5 p.m. on Monday, barely 30 seconds into speaking to her, my friend came back to life.I had no idea that that was just the beginning. It's been three weeks of a roller-coaster ride with the Lord. There are days when I wish I'd never specifically told him that I wanted to know the God I read of in the Bible. That God, is scary That God is so astounding, so unbelievable, that sometimes it feels like my mind is melting.But that God is exciting! And amazing. And awesome. I've run out of adjectives to qualify him. Sometimes, He will frustrate you....but His will must be done and it always ends in praise.There's nothing like knowing God for yourself. Yahweh is real. He's tangible. Now I understand, vividly so, why the apostles and disciples of old were beaten, tortured, killed and yet, they wouldn't let go of Yahweh. You just can't let go after you've tasted him in this way. He's...lit!Anyway, that's part of my testimony. The rest, you will definitely get to hear someday. In the meantime, if you're not serious, avoid the following songs:'Use Me Lord. ''Here I Am, Send Me. ''I Surrender All' (and I don't mean 'I Surrender to Your Ileke di'). People who don't have Jesus Christ in their lives....how are they doing it? Kai! **This picture is me and God right now. ?But, we good. *Over and out.